Every dharma practice is preceded by certain preparations that serve as a solid basis for correct practice. These preparations are divided into two kinds: the general and the special. The “four thoughts that turn the mind from samsara” belong to the general, or ordinary, preparations. What does it mean to turn the mind from samsara? It means freeing oneself of every attachment to life in the three realms of samsara. 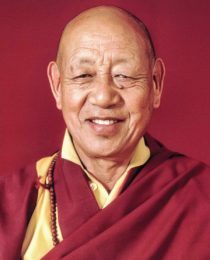 The four thoughts—the four general preparations—allow us to develop this freedom, as we reflect in turn upon the precious human birth, impermanence, karma, and the sufferings of samsara. referring to the preciousness of a human existence, which is very difficult to obtain. It is valuable because it is endowed with certain freedoms and abilities. Its preciousness is described through three aspects: by comparison with the greater situation, through numerical comparisons, and through analogy. 1. Birth in the paranoia states where one constantly experiences the suffering of extreme heat and cold. 2. Birth in the hungry ghost realms where one constantly experiences the suffering of hunger and thirst. 3. Animal birth, where beings have the experience of being hunted and oppressed, of constantly eating each other and being misused. 4. Birth in uncivilized lands, where one has no opportunity to learn something leading to a positive path. 5. Birth as a god, especially a god with a very long life. As a result of earlier positive acts a god with longevity experiences happiness and joy during his life. However, experiencing the results of positive karma in this way means that this karma will eventually be exhausted. After their long lives these gods are reborn in lower and very painful states. 6. Life as a being with mental disability, where one can neither understand the meaning of the dharma, nor practice it. 7. Life with incorrect views when one automatically tends to accumulate negative actions, and therefore the causes of future suffering. 8. Birth in a time when no Buddha appears, when there are no Buddhist teachings, and therefore one receives no help to free oneself from the suffering of samsara. In these eight kinds of existence, one experiences only suffering. One has no experience of freedom in the sense of being able to practice the dharma. Having a precious human body means that one has not only avoided these types of existence, but also that one is equipped with certain capabilities. Here, ten aspects are described. Five of these concern us directly. • One was born in a human body. • One was born in a region in which the Buddha’s teachings are accessible. • One has intact sensory organs. • One does not have false views. • One has a natural trust in the dharma. • One was born in the times when a Buddha has appeared. • This Buddha has given teachings—something we should not take for granted, since not all buddhas necessarily give teachings. • These teachings, if given in the past, have been preserved and are still accessible. • One grasps and practices these teachings. This is a very personal condition, despite being listed with the external aspects. If one finds oneself in the excellent situation described, but does not practice, then having access to the teachings does not really do much good. • One must also have a good heart, and a naturally loving disposition towards other beings—again, a very personal aspect. tive karma in previous lives. Above all, there is one cause that allows us to be re-born under such precious circumstances: this is the adherence to a discipline. On the one hand, discipline has to do with the various sets of vows we take on the way toward personal liberation. On the other, it has to do with avoiding the ten negative actions. However we formulate it, the quality of discipline is the direct cause for obtaining a precious human life. There are stories that convey the difficulty of obtaining a precious human life. For instance, imagine a glass house with completely smooth walls. If somebody throws raw peas at the glass walls, most of them will bounce off and fall to the floor. It is most improbable that the peas will stick to the glass. However, if you constantly throw peas at the glass, sooner or later one is bound to stick. The probability that you will obtain a precious human body is much smaller than the probability that a pea will stick. Or imagine that a small ring is floating on the ocean. On the bottom of the ocean there lives a special turtle that surfaces briefly only once every hundred years. The probability of its head surfacing within the ring is pretty slim, but far greater than the chance of obtaining a precious human body. One can also illustrate the value and the rarity of a human body when one compares the numbers of different kinds of beings. For example, there are pretty exact estimates of how many people live in this country. It is well known. However, if you tried to count how many insects live on just a small piece of land, this would be impossible. All of us here were born under circumstances that make our human life very precious. We should remember that we have our precious human life because we have accumulated a great amount of positive potential and purified our minds of many obscurations. Right now we are enjoying the results of this, but it is important to use these results in the best and most sensible way possible; otherwise we are simply squandering them. It would be as though we had taken a journey specifically to get something and come back empty-handed. Or as though we had carried an empty bucket to fetch water, and returned with the bucket still empty. In each case, a wasted trip. We should strive to make the most of our fortunate situation, and not fritter it away. sible for one person to practice them all. Therefore, one should practice those methods that correspond to one’s capabilities. Dharma practice, at its best, means practicing like Milarepa and turning oneself away from all worldly concerns. In today’s world, however, there are only a few people who are capable of practicing the dharma to this degree. If one is not capable of practicing like this, one should resolve to practice to the extent that is possible for one personally. One should do as much as one can. This relates to all our practices: meditation, accumulation of merit, purification practices and, of course, the preliminary practices. One way to continually accumulate positive merit is to make offerings to the buddhas. At best, one offers a large amount of things that one has. When this isn’t possible, one can always offer clear water. If this isn’t possible either, one can offer a lot of flowers. Or, failing this, with a mind full of devotion, one can imagine flowers and offer these to the buddhas. In one’s mind, one can also offer any flowers that one sees during the day. By making offerings to the buddhas in whatever way possible, one can accumulate positive tendencies in one’s mind. Another possibility is to be generous to the sangha. One should be as generous as possible and support the sangha with a respectful mind. The third possibility is to be generous to all sentient beings. One does whatever is possible to help them. For instance, when one comes across a thirsty animal, one gives it water. These various examples show that it is always possible to practice useful and meritorious actions on different levels. One should really try to do this to the extent that one can, so as to strengthen one’s own positive potential and destroy the negativity that burdens the mind. on the avoidance of the big negative actions but should also distance oneself from those small actions which one so easily encounters. For example, imagine a huge pile of dry grass, as big as a mountain. If this pile is ignited with even the smallest spark, the entire pile of grass will go up in flames. In a similar way, even the smallest negative action can have a very destructive effect. This also applies to useful actions. One should never think that small positive acts would have no worth and therefore never even make the effort to perform them. One can very easily take this point of view. One thinks that one really isn’t able to accomplish positive actions to any significant degree and, therefore, one never even makes the attempt. But a positive action will always have a corresponding result and one should always do what is possible on a personal level. With respect to practice, one should never think that it isn’t worthwhile to start because one cannot do a significant amount. One should practice as much as one can, however much that is. The second of the four thoughts deals with impermanence. There are many ways for a human life to end before coming to a death from old age. A butter-lamp consists of a container with butter and a wick. When such a lamp is filled to the brim with butter and the wick is not yet lit, this corresponds to the situation of a person that is not yet born. A butter-lamp that has fully exhausted its fuel corresponds to a person who has died of old age. Between these two examples there are a great number of variations. There are in fact many more conditions that can cause death than there are conditions that support life. Our life can be compared to a drop of dew on a blade of grass—it is very fragile and as soon as the sun comes up it evaporates. Life is very precious not just because it is very difficult to obtain, but also because it is very easy to lose. The precious human body brings many possibilities, but there is one certainty, and that is death. Uncertain, however, is the exact moment when it will come. It doesn’t follow any rules. Children don’t necessarily live longer than their parents. Teachers don’t necessarily die before their students. Even though people actually know this from their own experience, they seem to think it’s normal to believe that children will naturally live longer than their parents. However, if you take a look around and take your own experience into consideration, you will conclude with certainty that these things are not predetermined. Although one has the good fortune to still be alive, it is absolutely not a matter of course that this will continue so. The moment of one’s own death can come at any time. That is the problem with life. It is so fragile, so easy to lose, and so easy to destroy. At the moment of death one is very alone regardless of how close one is to one’s family, how many brothers or sisters one has, or how many close and dear friends one has. They cannot accompany or help us at the moment of death. Even the material things which seem so important to us, regardless of how much money we save, how big and attractive our house and our car are, we will not be able to take any of it with us when we die. This also applies to that which is closest and most dear to us—our body. Our shadow has accompanied us throughout our entire life. We do not have to carry it along or worry whether it is there or not; it is automatically there. But even our shadow cannot accompany us beyond the point of death. The only things that really count at the moment of death are the tendencies that we have accumulated in our mind. Both the positive and the harmful impressions will accompany us whether we want them or not. We cannot just take the positive impressions and leave the negative ones behind. These tendencies will determine our state of mind. They determine how we experience our death and the time afterwards. If we have accumulated a great amount of positive impressions in our mind, then we will experience the appropriate result. We will experience a lot of happiness and won’t encounter the suffering that goes along with harmful tendencies. However, if negative tendencies are dominant in our mind, these will determine our experience in the sense that we will experience suffering and pain. We should be aware of this. For our death and that which follows, nothing other than the way in which we have lived can help us. Karma deals with causality. A specific action leads to a specific result. A positive act will lead to a result of a positive nature, hence, to the experience of happiness and joy. On the other hand, a negative act will unavoidably lead to a painful result. It will most certainly cause suffering. This happens of itself because the result will unavoidably correspond to the nature of the cause. For example, if you plant a seed, a certain kind of plant will grow from this. From a rice seed, a rice plant will grow and not any other kind. Therefore, it is very important to be careful and to do everything possible, from the greatest to the seemingly smallest acts, in order to strengthen positive behavior. The dominant tendencies in our mind will be the first to ripen. If they are characterized by negative kinds of behavior, then we will experience this first and they will be dominant in our lives. We will then experience suffering and will not be happy. This exacerbates our problems because we won’t manage well in life and will get into more trouble. If, on the other hand, we strengthen our positive and useful behavior, then our happiness and joy will increase and become our prevailing experience. This then reinforces our ability to strengthen positive behavior. The four thoughts were not simply invented by somebody in order to deceive you. They are authentic, completely true, and were taught by the Buddha Shakyamuni. The Buddha gave these teachings out of his all-knowing wisdom, his loving kindness, and his exceptional ability. Everyone has strong obscurations in his or her mind, of which the main disturbing feelings are attachment, anger, and ignorance. On the basis of these disturbing feelings, a great number of other disturbing feelings arise in our minds. These influence our actions and so lead to many other negative activities. In our present situation, disturbing feelings are pretty dominant and lead to the physical, verbal, and mental activities through which we accumulate negative karma. Generally speaking, there are a great number of negative activities, but they are divided into specific categories. Three have to do with our body: killing, stealing, and causing sexual harm. Four have to do with our speech: lying, slander, divisive speech, and idle talk. The three negative actions of our mind are ill will, envy, and the cultivation of false views. These ten negative actions should be avoided at all cost. In the meantime, one should do the opposite, namely engage in the ten positive actions that are the reverse of the negative actions already mentioned. There are five negative actions that carry an extreme amount of negative force. They are referred to as “the five extremely harmful actions.” These are: (1) to kill one’s own father, (2) to kill one’s own mother, (3) to kill an arhat, (4) to physically injure a buddha or one who represents the Buddha, such as one’s own teacher (this also applies to the destruction of representations of the Buddha), and (5) to divide the sangha. course with a realized arhat, and (5) to steal from the Three Jewels of Buddha, dharma, sangha (for example, to take back an offering). In general, negative actions don’t have a single good quality; they are simply harmful. The Buddha, however, said that negative actions do have one good aspect, and this is that one can purify oneself from the negativity one has created. This purification is possible through the application of the “four powers,” which are regret for the action, reparation of its ill effects, resolution not to repeat it, and renewal of our refuge in the Three Jewels. Even with the four powers it is extremely difficult to remove the tendencies that have been created by the five extremely harmful actions. It is also difficult to deal with negative impressions in the case where one has absolutely no trust in the Three Jewels and clings to false views. Because of our karma which leads to the ripening of certain experiences, the wheel of conditioned existence continually turns. This is samsara. Actions and karma accumulate, and through this, experiences manifest. When positive actions are predominant, one will experience a more or less joyful result. When negative actions predominate, one will mainly experience suffering. In this way, within samsara one differentiates between six different kinds of experiences or states of existence: paranoia realms, ghost states, animal existences, human existence, demi-god, and god states. Regardless of which of these situations one observes, one finds nothing but suffering. Samsara is nothing but suffering because it is simply the result of accumulated actions. We can take a quick look at the six states in order to gain some insight into what it is like to live in each. The paranoia state is not just a realm into which one is born. It is the name for a state of mind which is further divided into various sub-realms. There are, for example, eighteen different hell realms. In eight of these, beings suffer primarily from intense heat, and in eight others, they suffer predominantly from extreme cold. There are two more hell realms similar to these, making a total of eighteen. In all of these states nothing but heat and cold is experienced. One could think that there is indeed great suffering in the paranoia realms but that the other realms may not be so bad. One should then take a look at what is experienced in the ghost worlds. Those born in the hungry ghost state suffer greatly from hunger and thirst. In one description of this realm it is said that in a hundred years’ time, a hungry ghost will not once hear the words nourishment or water and has absolutely no means of obtaining either. Hungry ghosts are described as having stomachs as big as mountains and mouths as small as a single hair. It is totally impossible for them to obtain nourishment to pacify their hunger and thirst. Even when they do find food or water, in the same moment they are about to drink or eat it, it is transformed into something repulsive, like blood or pus. This is their prevailing experience. Once again, one could think that things aren’t so bad in the animal realm. However, when one takes a look at the situation, again one finds only suffering. It is easy to see how much suffering animals in water and on land experience, how they are constantly hunted and misused. These realms are called the three lower realms because suffering is very dominant there and of quite a brutal nature. However, we really don’t find anything but suffering in the three higher realms either. For example, the predominant problem with the asuras (demi-gods) is jealousy. They see the pleasant experiences of the gods and are envious because their own experiences pale in comparison. Therefore, they are continually fighting against the gods, but they never win. They are always the losers and are continually jealous. This is what conditions their suffering. However, even the real gods suffer. Although they have a lot of fun during their lives, they experience a great amount of suffering before their death because they become aware that they are dying seven days beforehand. Seven days in a god realm is equal to seven human years. The gods see where they will be reborn after their death, and because they have used up all their good karma they will fall into the lower realms. During the process of decay that occurs as their death approaches, they recognize certain signs. For example, the flowers that adorn their bodies begin to wilt and their bodies begin to smell bad. Thus the suffering pervades the god realm as well. Finally, in the human realm one experiences the suffering of birth, old age, sickness, and death. Hence, regardless of which realm of existence one looks at, one sees that suffering and samsara are one and the same. One can compare samsara with sitting on the top of a needle. There is not one moment without suffering. “The four preliminary practices are more profound than the main practice.” For one’s own development in dharma practice it is extremely important to take the time to develop a clear understanding of these fundamental views. After one has gone through every detail and understood the explanations of the precious human body, one can then fully appreciate it. Next, one goes over impermanence. When one has considered this thoroughly, one naturally understands how karma works, how samsara functions, and the suffering that exists in the various realms of existence. 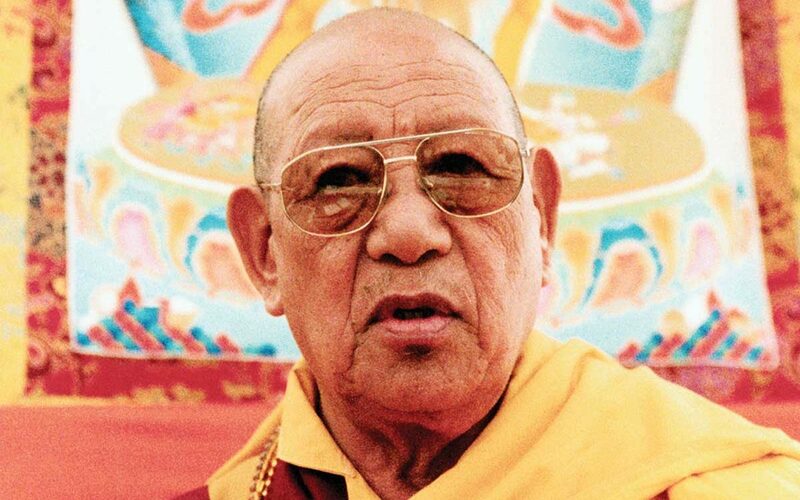 When one has developed these fundamental views, one possesses a solid foundation on which to build one’s dharma practice, namely, the Four Foundational Practices of Prostrations, Diamond Mind, Mandala Offerings, and Guru Yoga. Upon this firm base, one is able to let direct realization arise. If one doesn’t take the time to build a strong foundation it could be difficult to achieve the desired result of all these practices. It is like building a house. Without a good foundation, the house could very easily collapse. There is a lot more to explain regarding this topic, but I ask you to keep in your mind what has been said here. Being in samsara means suffering. We should, however, be glad that we had the karma to be reborn with a precious human body. This is a fortunate situation because it means that we have excellent possibilities that are not found in other realms of existence. We have a certain amount of freedom insofar as we are able to discriminate between good and harmful actions. We are able to give up negativity and to concentrate on positive actions. If we practice being useful throughout this life, we will be able to attain a state of liberation from samsara. If, on the other hand, we don’t bother with positive actions or practicing the dharma and continue to act negatively, then we will also get the corresponding result and we will not be able to free ourselves from samsara. We will continue with the never-ending cycle of rebirth in one state of existence or another. For this reason, we should really be aware of the great opportunity here and now and do our very best to use it while we can. Take the time to study dharma and to practice. This is useful and I want to encourage you to continue doing it. Do not ever be discouraged in your dharma practice. Enjoyed this article? For more like it, subscribe today! Lopön Tsechu Rinpoche (1918–2003) was born and lived in Bhutan until he was 13 years old. At that point he left Bhutan to study and practice under the spiritual guidance of his uncle Lama Sherab Dorje in Nepal. There he received full Buddhist training and meditated under severe conditions in the caves of Milarepa and in the holy places of Guru Rinpoche. In 1944, Rinpoche met H.H. the 16th Gyalwa Karmapa, who became one of Rinpoche’s most important masters. Our goal at Buddhism Today is to present Buddhist meditation in a practical way, so that everyone can use it even in the midst of their busy, modern lives. 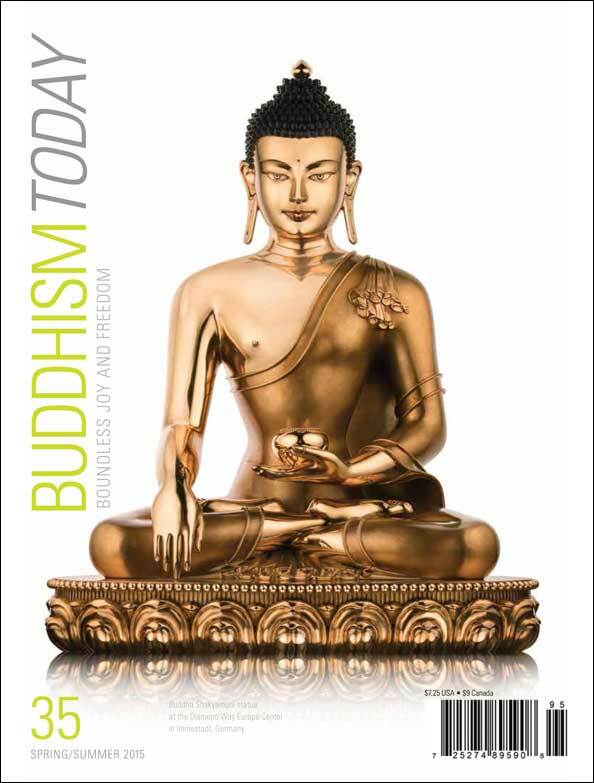 Buddhism Today Magazine is a bi-annual magazine published by Diamond Way Buddhist Centers USA, a California nonprofit corporation.